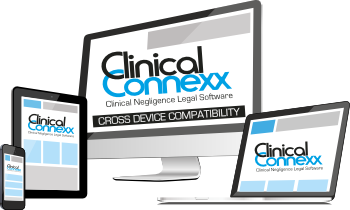 Clinical Connexx is cutting-edge legal case management software that has been developed for clinical negligence solicitors and law firms. Clinical Connexx is developed to help streamline clinical negligence claims handling in a post LASPO Act and fixed fee legal environment. It includes built-in workflows, automatic cost budgeting tracker, precedent-H billing, one click launch for documents, letters, precedents and lots more. Clinical Connexx is cloud based software solution developed in Microsoft Dynamics CRM and each user license is bundled with Microsoft Office 365. Whether your billing on a fixed fee or hourly basis Clinical Connexx is easy to use and will streamline processes, improve productivity and increase profitability. Copyright 2013 - 2017 Clinical Connexx. Website Designed By Outspire Group.